In this guitar lesson you will learn how to use a DigiTech Whammy pedal used by guitarists such as Tom Morello, Joe Satriani, Steve Vai, Jack White and many others. If you haven’t use a Whammy pedal before, it’s an incredibly versatile and creative pitch-shifting effect that can provide you with an ongoing source of inspiration for new licks, riffs and ideas. The original DigiTech Whammy pedal was released in 1989 and there have been quite a few newer models since. 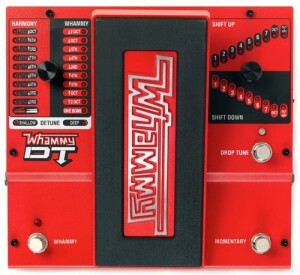 While there are other brands that offer the same effect, I recommend buying a DigiTech Whammy. DigiTech knows how to create great pitch shifting effect pedals and the DigiTech Whammy is the gold standard among guitarists. 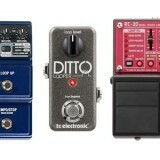 There are two DigiTech Whammy pedals I recommend and which one you choose depends on what features you want to have. The Whammy 5 is not surprisingly the 5th edition of the original Whammy pedal. It will give you all the classic whammy settings and sounds and includes 10 whammy settings, 9 harmony settings and 2 detune settings. It also includes two modes: classic and chords to also allow you to experiment with pitch-shifting chords. If you’re looking for a Whammy pedal with all the essential features, this is an excellent option. The Whammy DT (for Drop Tune) gives you all the essential Whammy settings as well as a new set of options. As explained in my in-depth review on the Whammy DT here, in addition to all the standard Whammy pitch-shifting and harmony effects, you can also drop tune your guitar or use a ‘virtual’ capo. 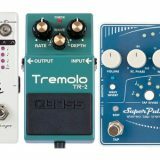 This means if you want to switch between Drop D tuning and Drop B tuning, you can use the pedal to do it for you without having to touch your strings. If you play a lot of songs in various tunings, this extra feature is well worth the extra cost. 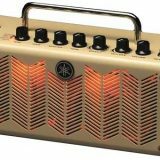 My recommendation between the Whammy 5 and the Whammy DT is to buy the DT – the extra features it gives you adds a lot of flexibility to how you can use the effect. Let’s start with an easy exercise to get used to smoothly bending the pitch of a note using the Whammy. This is how a lot of guitarists use the Whammy and while there are many other ways you can use it, it’s a lot of fun and can sound great. We will be using the Whammy pedal to bend a note up an entire octave when we push down on the pedal. You can hear this used in countless songs. It’s simple and it will get you used to control the pedal. Setting the Whammy: the setting you want to select on your Whammy is the 1 Octave up option. Make sure you select this on the ‘Whammy’ section and not the ‘Harmony’ section. Tone: an overdriven tone will be used in this exercise. Whammy effects usually sound best with a high drive guitar tone although you can definitely use a clean tone. Use any distortion or overdrive you prefer with this exercise. I recommend using a neck pickup as it will give you a thicker tone. To make this easier to understand, I have used the symbols O & + to indicate when to push the pedal back and forth. These symbols are normally used for wah pedals. The O means to have the pedal in the heel position and the + means to push the pedal into the toe position. If that doesn’t make sense, read my wah pedal lesson here. Start with the pedal in the heel position. Pick the note then smoothly roll the pedal forward until it finishes in the toe position. You will hear the note bend up an octave. After the note rings out at the higher pitch, mute the string with your picking hand to stop the note. Then roll the pedal back to the heel position. Once the pedal is back in the heel position, you can continue to pick the next note and repeat the process. The goal here is to build up your coordination between playing a note and moving the pedal. Start at a slow pace and roll the pedal slowly. As you build your confidence, play faster and move the pedal faster. Eventually, you should be able to rapidly pick the notes while keeping the pedal moving in sync with your playing. Work on this exercise until it becomes smooth before moving on to the next exercise. Tom Morello makes great use of the Whammy in many Rage Against The Machine and Audioslave songs. The Whammy is an integral effect in his rig (read about his rig here) so if you’re a fan of either band, a Whammy is a must buy. The Audioslave track Like a Stone is simple yet powerful. It makes great use of the Whammy and is simple for even beginners to play. Setting the Whammy: you will need to set your Whammy to the 2 Octaves up option. Just like the exercise above, make sure you use the ‘Whammy’ mode and not ‘Harmony’. This setting will bend your note up two octaves when you push the pedal down. Tone: use an overdrive pedal or your amp to produce a nice thick tone. Don’t use too much gain as too much gain will result in a mess when we add in the delay. I recommend using a neck pickup throughout this solo as the high pitched tone can sound a bit too piercing when using a bridge pickup. The neck pickup will also thicken your tone which sounds great with the delay and Whammy. Effects: Tom uses a BOSS delay pedal but you can use any delay pedal to produce the same effect. Aim for a delay time of 530ms and moderate decay so it repeats the signal 4-5 times when you play a note. The delay time is important as it creates a slapback style delay during the last section of the solo. 530ms is a quarter note (1 beat) at the song’s tempo of 113bpm. So when you play a note, the delay repeats it one beat later. So if you can match the delay time to the tempo it will create an excellent rhythmic effect. If you have trouble getting this exercise to sound right, go back to the first exercise to practice basic pedal control. Use your picking hand to mute the strings as you move between the notes to keep everything as clean as possible. This is an extremely easy thing to do and can be very useful when you’re writing songs. The White Stripes’ song Seven Nation Army uses a DigiTech Whammy in this way. The basic idea is that you use the Whammy pedal to shift your pitch down an entire octave so it sounds like a bass guitar. Setting the Whammy: choose the Whammy option 1 Octave down. This time you will move the pedal into the toe position and leave it there. You won’t need to rock it back or forth at all – leave it in the toe position the entire time. Tone: use a clean tone and adjust your EQ as needed to try and get as close as possible to a bass tone. Avoid using other effects at the same time as most bass guitarists use a very dry signal. Play around with single-note riffs you know to get a basic feel for what it’s like playing bass riffs. You might even want to look up TABs for bass riffs and try to play them using the whammy. Tom Morello often used his Whammy in the Harmony mode in combination with a wah pedal. 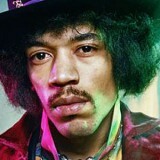 Have a listen to the solo in Guerrilla Radio to get an idea of this combination of effects. In this exercise, we will use both a Whammy and a Wah. If you haven’t used a wah pedal before, go through the exercises in my Wah lesson here. This exercise will use the Harmony setting to create a harmony of a 5th higher and mix it with the original tone. After you learn this exercise, experiment with different Harmony settings to hear how different intervals will change the feel of what you are playing. Setting the Whammy: in the Harmony settings, choose the option where a 5th higher is created when the pedal is in the toe position. Leave the pedal sitting in the toe position the entire time to keep that harmony. Wah: this exercise also uses a wah. Any wah will be suitable. Check out my review of the Original Dunlop Crybaby here if you don’t have a wah to see why it’s worth getting one. Tone: use an overdrive or distortion and experiment with different pickup options to get a feel for what you like the best. I used a single coil neck pickup during this exercise to give it a thicker tone. I also cranked up the gain and added a delay to get a really dirty tone but you should also experiment with a cleaner signal. The feel I was going for was a gritty and over-the-top sound. This combination of effects sounds great with a lot of rock and blues licks to give them a new edge. Play this exercise again with the whammy set to an octave lower in harmony mode and you might recognize the tone used in a wide range of songs. Joe Satriani and Steve Vai make great use of the Whammy pedal to create smooth legato-like phrases. Setting the whammy one octave higher simulates a twelve fret slide up and down the string when a note is held. When you think of the whammy this way, you can come up with licks with smooth glides between notes. You can even use the whammy to simulate a lap steel guitar which is similar to what you hear David Gilmour achieve at the start of the song Marooned. In this example you need to use the whammy pedal in a rhythmic way or else the lick won’t flow. The easiest way to imagine this is that every time you push forward or backward on the pedal, it should sound like you’re sliding up or down to a specific note. When you hear the lick it should sound like there are a few very fast and long slides but it’s actually the whammy moving back and forth. Setting the Whammy: you will need to set your Whammy to the 1 Octave up option. Just like the exercise above, make sure you use the ‘Whammy’ mode and not ‘Harmony’. This setting will bend your note up one octave when you push the pedal down. Tone: I use the same tone used in the Like a Stone example. Neck pickup with a smooth overdrive. You can experiment with different tone and it even sounds great with a clean tone. Effects: delay and reverb have been used to fill out the sound and emphasize the smooth glides between notes. Learn to play the lick first without any effects, then add them in to hear how it enhances what you are playing. I have used the wah O & + symbols to help understand when you need to push the pedal back and forth. The bracketed notes simply mean you hold the previous note while pushing the pedal – you don’t need to pick the note again. Listen to the lick a few times before you try and learn it and start off slow to get the coordination right. Notice how some of the notes are played while the whammy is held in the toe position? This helps blend the entire lick together rather than only having one note played while rocking the whammy forward and back again. Once you get the hang of these exercises, you might want to check out other songs that use the whammy pedal in creative ways. Seeing how other guitarists use a whammy pedal can open up new ideas for you. Check out this guide for some great examples of the whammy in action. Many of the songs in the guide use the techniques covered in this lesson. So practice these exercises and you will get a feel for what you need to do in the songs. I also highly recommend experimenting with a clean signal and using chords with the pedal. If you own a newer pedal such as the Whammy DT, you will be able to use the pedal with chords without any problems.